"It's me and you, Baron, against the forces of fashion." Count van Rani, the Iron Klaw, is the ruler of the Eastern European nation of Kalistan. Despite his rather menacing manner of dress, sinister nickname, choice to live in a giant castle, strong financial ties to shady corporations, army of brainwashed Transformers, and membership in a cabal of supervillains, we're sure he's a perfectly nice guy. Iron Klaw originates as the antagonist for the... *ahem* extremely 90s G.I. Joe reboot G.I. Joe Extreme. 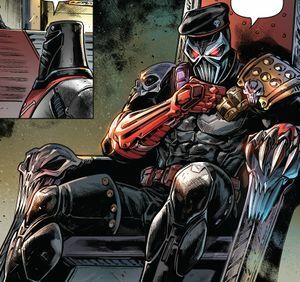 There, von Rani (as opposed to van Rani as he is in IDW) presented himself as the benevolent ruler of Kalistan when in reality he was Iron Klaw, the vicious leader of S.K.A.R. : Soldiers of Khaos, Anarchy, and Ruin. Whether IDW van Rani's villainy is a matter of public record or not is unknown, though Action Man and Mayday's reaction to hearing his name and knowledge of his pseudonym in "The Secret of the Mummy's Tomb" may point towards the former. The in-universe reality show/G.I. Joe Extreme parody Survival Extreme makes references to an Iron Claw who's involved with the forces of Scar as part of the show's fiction. Whether or not Survival Extreme's more grammatically correct villain has anything to do with van Rani is unknown. This page was last edited on 15 October 2018, at 04:02.